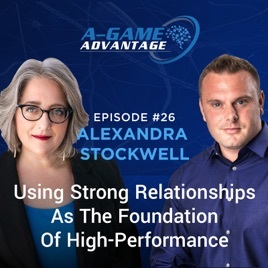 In this episode, Alexandra Stockwell, MD, a relationship and intimacy coach, reveals what high-achievers typically lack within their personal life. Elliot and Alexandra discuss the common concerns she hears from couples and why her work is so important for future generations. Listen in to hear a relationship expert share some tips to improve your own relationship – and find out what it really means to be good in bed. Visit A-Game Advantage or find us on iTunes to subscribe, visit previous episodes, and learn more about your host, Elliot Roe.